In terms of Walking Liberty Half Dollar coinage, the lowest production total after the 1921 issues is the 1938-D. The 491,600 mintage was small enough that at one point, Denver Mint personnel had all of them bagged and stacked on a single cart. Consequently, the 1938-D is very near the top of the list for focused collectors of the beautiful Walking Liberty Half Dollar. The coin has steadily increased in value for decades, but price wise, still remains attainable for collectors with modest budgets. 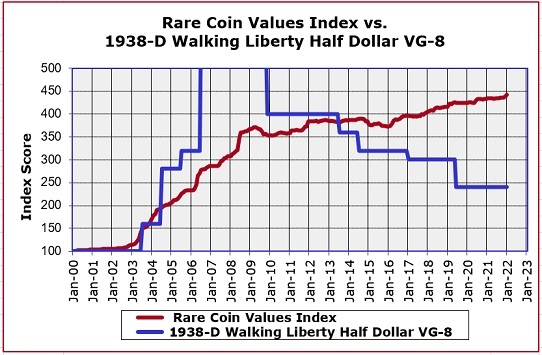 In fact, of all the 87 coins featured in the Rare Coin Values Index, the 1938-D Walker is the least priced. There is another thing that has kept the 1938-D value trends on the rise. Many collectors (especially those with limited money) seek to complete a "Long Short Set". This set starts at the 1934 issues and ends with 1947, the last year of the Walking Liberty Half Dollars. The 1938-D is the notable key date in this group. The blue line above charts the percent price increase since Year 2000 of the 1938-D Walking Liberty Half Dollar. As the data shows, the 1938-D has multiplied in value many times over the period. The 1938-D outshines the Rare Coin Values Index, (red line) which is the composite percent price change of a representative group of 87 rare US coins, starting at the same baseline of Year 2000. The objective of the Index is to get a feel for the strength and direction of the overall rare US coin market. The 1938-D Walking Liberty Half Dollar is one of the 87 coins that comprise the Index. The Index is updated monthly.